Guests are going to come with a special gift to celebrate this momentous occasion; send them home with original bar mitzvah party favors so they will never forget your child's big day! A traditional Jewish Bar Mitzvah takes place when a boy turns thirteen. The term "Bar Mitzvah" means "Son of Commandment" and it signifies the child becoming responsible for their own actions, rather than relying on their parents. He is also able to fully participate in all areas of the Jewish faith. In English, the term also applies to the actual ceremony which is widely celebrated by the family of the boy. Do you love this cookie as much as we do?! Visit M&M Designs for superb sweet treats! Tefillin Box with Treat. Create little boxes in the shape of the traditional Tefillin, using black boxes and black ribbon. Using a gold pen, write the boy's name and the date of the ceremony. Inside the box, place a tasty treat such as a chocolate for guests to eat. Seeds. You can do this one of two ways -- (1) Plant a few seeds in mini-pots (one pot per guest). Include a tag around the pot which includes the boy's name, date of ceremony, and a phrase such as "Planting Seeds for the Future." (2) Put seed packets in cellophane baggies. Tie off with a ribbon and include a tag with the same information above. Cookies. Sweet treats are always a favorite with the younger crowds, and cookies are the perfect treat for Bar Mitzvah personalization. 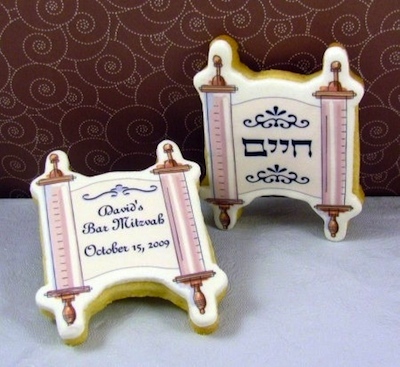 You can keep the cookie round and decorate with symbols such as the Torah, the boy's name, and the ceremony date. Or you can actually shape the cookies like a traditional Bar Mitzvah symbol. Add "Mazel Tov" for congratulations! Chocolate Bars. Another favorite sweet treat! Purchase the boy's favorite candy bar (or just go with traditional Hershey's Bar) and personalize with a label. You can make the labels yourself (using regular name tag labels available at an office supply store) or you can purchase them (using links or right). Be sure to personalize the label with the boy's name, ceremony date, and an applicable phrase. Halva. A traditional Jewish sweet, you can either purchase or make these little "bars" yourself. Then package them in clear cellophane, tie off with a ribbon, and include a tag with the boy's name, ceremony date, and "Mazel Tov." Return from Bar Mitzvah Party Favors to Home.